Nowadays, it takes a lot for me to get out of the house during weekends. There are very few things that will make me dress up and go to the crowded mall willingly instead of staying at home to rest. In the past two weekends, the sole reason I left my bed was the film Call Me by Your Name. 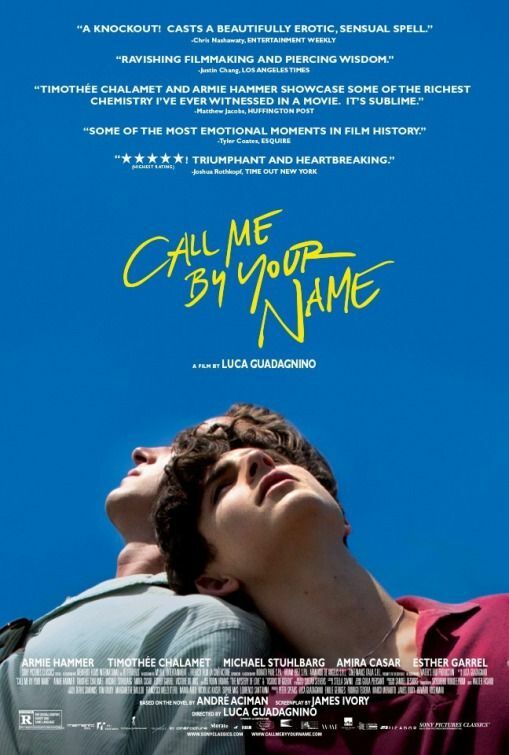 Directed by Luca Guadagnino and based on the book by André Aciman, Call Me by Your Name is about Elio and Oliver’s love affair that one summer in Italy. Elio is the 17-year-old son of a professor (in the movie, his father is a professor of archaeology) and their family hosts a doctoral student for six weeks every summer. That year, the guest was Oliver and Elio, with all the turbulent and intense emotions that come with being a teenager, fell in lust and love. There are differences between the book and the film, of course, but I still found the film a most faithful adaptation. The screenplay does away with excess characters and plotlines but still captures the spirit and essence of Aciman’s novel. Timothée Chalamet and Armie Hammer, the actors who play our young lovers, also deserve the utmost praise, Chalamet in particular for his absolutely remarkable portrayal of Elio. But I’m not here to wax poetic about how beautiful the film is (and it really is beautiful). You can read all the reviews floating in the Internet for that. There are just certain aspects about the adaptation I really wanted to talk about here. First of all, one is not required to read the book to enjoy the film. It is stunning all on its own and tells a slightly different story from the book. However, I do believe that reading the novel will enhance the viewer’s experience of the film tenfold. And vice versa. The book, just under 250 pages, is told solely from Elio’s point of view and we are privy to all his thoughts and confusions and doubts and elations and it is wonderful to read. It helps you understand why Elio acts the way he does in the film, why he goes from hot to cold, desperate to indifferent and back to despairing for Oliver’s attention. Like I said, Chalamet did a splendid job showing all of Elio’s conflicting feelings but that’s because I knew, as we were watching the film for the first time, the internal monologue that was going on in Elio’s head because I had read it. I’m not so sure I would have understood Elio as well as I did had I not read the book beforehand. The strength of being told in the first person POV also sets the book’s limitations. In the book, the only image we have of Oliver is the one by Elio and his, should I say, rather biased memory (we find out eventually that an Elio 20 years later is actually the narrator, which is why his words are dripping with nostalgia). All he knows of Oliver is what Oliver chooses to share with him. The film, however, offers glimpses to an Oliver that even Elio doesn’t see. Elio views him as this confident, loud, so-sure-of-himself American, wise for his age, intelligent and intimidating. But there are several scenes where Elio is out of the frame asleep or behind a closed door, or blurred in the background behind Oliver, and the camera closes in on Oliver’s face, trepidation and uncertainty written in his eyes and body language. These shots are far and few in between, sure, but they’re enough to tell the audience just how insecure Oliver can be. During their last night Rome, we get a millisecond of a flashback of their drunken night together, but it is Oliver who is awake and remembering, which I thought was an interesting creative choice to make. This is Oliver’s story as much as it is Elio’s. And I can’t really talk about Call Me by Your Name without mentioning the speech Elio’s father gives him after Oliver returns to the States. You know how some words are only meant to be read because once you speak them out loud, you realize just how cheesy they are? That’s what I thought initially about Mr. Perlman’s speech (yes, Elio’s last name is Perlman) as I was reading it. It’s so powerful but also so easy to ruin if done incorrectly. Thankfully, Michael Stuhlbarg delivered and we’re left wishing to have had a parent, or become one, as accepting and as honest as Lyle Perlman. I guess my only gripe about the film is that they took out Vimini, Elio’s 10-year-old neighbor who strikes up a friendship with Oliver that even Elio doesn’t fully comprehend. She also has leukemia and has died by the last chapter in the book. I loved Vimini because, to me, she represented a side to Oliver that was fragile and innocent, which is why they took to each other so quickly. It’s understandable why they cut her and so many other minor characters from the film. The focus is on Elio and Oliver and their discovery and exploration of their desires. Maybe including Vimini would just complicate the plot, distract the audience, add an unnecessary layer to what should be a simple (is it really?) tale of love and loss. Still, I missed her. There is still so much I haven’t mentioned: the almost slapdash editing in some parts; the effective use of silence; the music; the ambiguity of the setting relating to the ambiguity of Elio and Oliver’s relationship (and that ending in the book); that heart wrenching parting at the train station; that phone call during Hanukkah; life moving on during the ending credits. Also, how pretty and perfect are Timothée Chalamet and Armie Hammer together? Uhm, brain cannot compute? ?